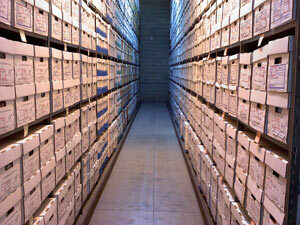 Good Records Management is "key" to efficient operation of your business. Timely access to information means the difference between success and failure. King Information Systems, Inc. provides off-site records storage and management so that you can focus on what's important to your business. We take the hassle out of the information age without leaving you in the dark. We provide records storage and management for any market, including education, financial, government, health care, insurance, legal and accounting. Our services are scalable to the size of your company and tailored to meet your specific needs. Our professional staff will work with you to develop and implement a cost-effective records storage and management program. In addition, KIS provides consultation and training covering applicable regulations to ensure the security and privacy of your records. By entrusting your records to us, you not only address the space issue but, our staff will be available to answer retention questions, to assist with storage issues such as purging and destruction, as well as microfilming, and so on - we provide much more than just space! Studies have shown that professional staff spends hours per week searching for important documents. Outsourcing your document storage and retrieval to King Information Systems means that your important documents are simply a phone call, fax, or email away. All of our staff are highly professional and are bound by confidentiality agreements. With our state of the art scanning technology, we can also provide immediate electronic delivery of documents direct to your desktop as a TIFF or PDF file for situations when the original file is not required.